It is highly debatable how "green" some green polymers actually are. The idea of fermenting crops to lactic acid and making a polymer from it sounds green enough, but in reality it is a complex process and Life Cycle Analysis doesn't suggest that PLA is wonderfully green. But there has been an enormous interest in PLA. As a polyester it has some inherent attractions (for example, it is crystal clear) and there are some dreams of it being a replacement for PET film. However, PLA tends to be brittle and in many ways inferior to PET so the obvious need is for additives to improve its properties. Two typical needs, discussed here, are for good plasticisers and improved barrier/mechanical properties via addition of nanoclays. 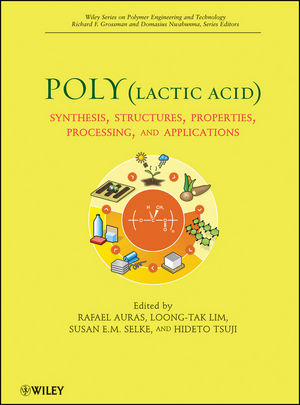 Abbott was asked to write a chapter for what has turned out to be an excellent book: Rafael A. Auras, Loong-Tak Lim, Susan E. M. Selke, Hideto Tsuji (Editors), Poly(lactic acid): Synthesis, Structures, Properties, Processing, and Applications, Wiley, 2010. Researching the chapter it was immediately apparent that a vast amount of work had been done (and a lot of PhDs sacrificed in the process) that was doomed to failure right from the start. As is often said, 3 months in the lab can save a day in the library. Applying simple solubility theory would have pointed researchers away from routes guaranteed to fail towards routes with at least a reasonable chance of success. For example, because PLA is a green polymer it makes sense to use a green plasticizer, so lots of people tried those based on citric acid. 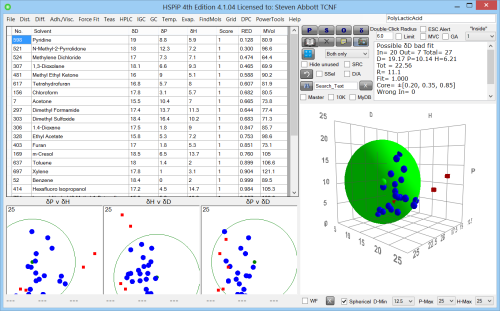 However, with a few solubility datapoints from an academic journal it was possible to estimate the HSP of PLA via the Sphere fit. Although this particular fit gives HSP of [19, 10, 6] some further sanity checking gave a value of around [18.5, 8, 7]. But a quick calculation of the HSP Distance between PLA and the citrate plasticizers showed it to be large - they simply weren't compatible. So it was pretty much guaranteed that over time such plasticizers would exude to the surface - which all those PhDs indeed found. Had they used HSP as a guide right from the start they could have saved themselves a lot of trouble and focussed in on molecules much more likely to be successful. As it is easy to be negative, Abbott thought of some molecules which might be safe, green and with a short HSP Distance from PLA. When he searched the literature he found that a major Japanese company was using such a molecule specifically because it did not exude out over time. An even more tragic waste of time was the search for nanoclay additives to increase the tensile and barrier properties of PLA. The idea is basically sound; in the early years of nanoclays there were amazing results when they were added to nylon polymers. However, for most other polymers the results have been disappointing. A key reason is that in order to work, the nanoclays must be fully dispersed, down to individual sheets. The clays are opened up by exchanging the sodium anions for tetraalkylammoniums, typically with long "tallow" chains. Most commercial nanoclays have so much "tallow" that their HSP are very far from PLA so it is of no surprise that the dispersions are failures. Yet one would read sentences like "PLA is hydrophobic therefore we used a hydrophobic tallow chain". Yes, PLA is hydrophobic in the sense that it is insoluble in water, but that's not the same as saying that it is happy to dissolve in, say, dodecane. With the richer language of HSP and, in particular, the important point that the δD value is rather high, it is clear that most of the common nanoclays will be (and indeed are) useless. Because nanoclays are so popular in principle and yet so disappointing to many formulators, it is hoped that a project to measure HSP values of several commercial clays will shortly take place. The results will be publicised on this page! Of course there is much more to nanoclays than their HSP. Edge effects, for example, can be crucial. Good formulators will start with the HSP approach then refine their ideas with other tools. Astute readers will have spotted that the HSP Distance between PLA and CNT is rather small. This implies that CNT will disperse readily in PLA - which, indeed, they do!